It has been an active month on the coastline of Ocean Beach. 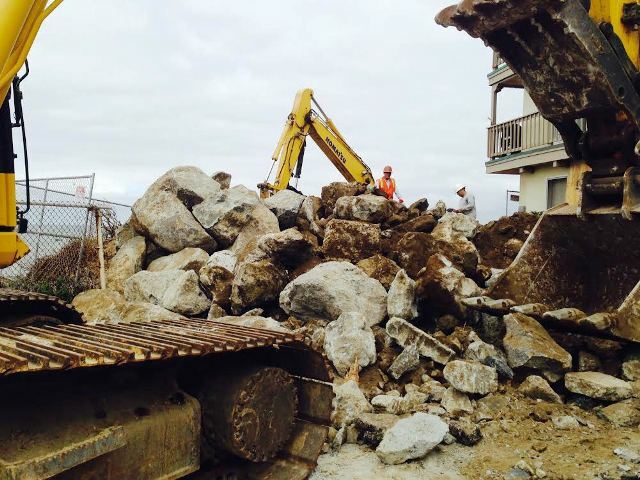 Two sea walls are under construction– one at the end of Bermuda Avenue and a second sea wall at the end of Pescadero Avenue. The Bermuda project is being done by Soil Engineering Construction, which also did the previous sea wall at Bermuda. 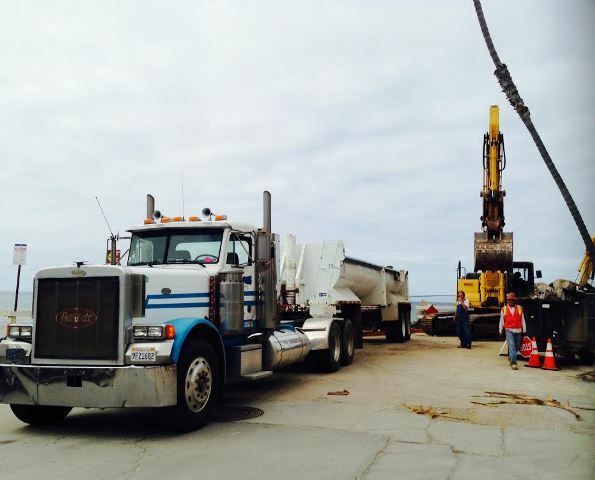 The Pescadero project is being done by J.C. Baldwin Construction Company. Construction at end of Bermuda Ave.
During my visit, boulders were piled high on Bermuda Avenue waiting to be hauled away in giant trucks and recycled at Fiesta Island. 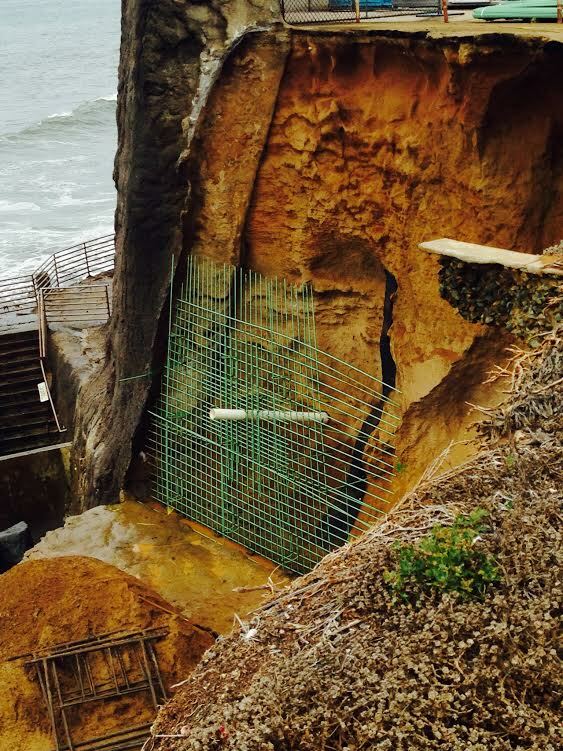 And rebar is already in place for the sea wall at Pescadero. Workers at the Pescadero site had been drenched by the morning high tide, and they were covered in water and sand. There is not much of a shoreline to work on at the base of the cliff there, and they are accustomed to being soaked all day as the waves splash them. The sea wall at the end of Orchard appears to still be in need of repair. However, reportedly the residents of the cave in the collapsing sea wall, an issue of major concern in the community recently, have vacated. For those who do not know already, sea wall projects such as the projects at Bermuda are not paid for with city, state, or federal funding. These projects are paid for by homeowners/property owners, and cost nearly the same as a house in the beach area. If an area of coastline is directly connected to a city street, the city has in the past funded and conducted sea wall repairs. “A seawall (or sea wall) is a form of coastal defense constructed where the sea, and associated coastal processes, impact directly upon the landforms of the coast. The purpose of a seawall is to protect areas of human habitation, conservation, and leisure activities from the action of tides and waves. As a seawall is a static feature it will conflict with the dynamic nature of the coast and impede the exchange of sediment between land and sea. Apparently according to Wikipedia again, and referenced as well in the New York Times, the world’s largest sea wall was in Kamaishi, Japan. It cost nearly $1.6 billion and failed in the devastating 2011 tsunami. Norimitsu Onishi in November 2011 reported in the New York Times that Tokyo decided to rebuild the sea wall as part of the reconstruction of the tsunami-ravaged zone, at a cost of at least $650 million. The tsunami and devastation in Japan caused people world wide to pause and reflect. Here in Ocean Beach, people watched for a rise in the tide and eagerly listened to scientists and geologists as they reported that the coast of Southern California was not susceptible or prone to tsunami activity. And we continue to pray that is the case. The coastline of California is different from the island nature of Japan — but the story of that massive sea wall in Japan puts into perspective how countries and cities world wide live at peace and war with the ocean, and the efforts, finances, and man power that countries and cities around the globe put towards these miraculous feats of engineering. 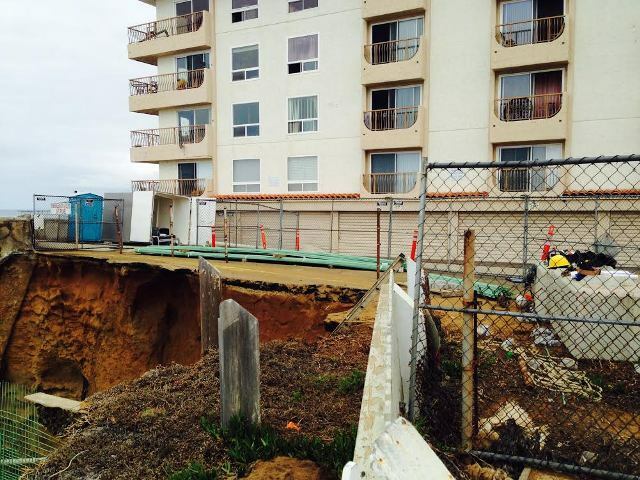 All photos of Bermuda and Pescadero projects are as of noon on Thursday October 15, 2015. It’s way past time to say NO to seawalls. The science says they destroy the beach in front of them by wave refraction and scouring. They eliminate sand replenishment by hardening the coastal bluffs. All to benefit the private landowners who were stupid enough to buy property on the edge of an eroding cliff. The beach and waves belong to everyone. The surf spots there have already been destroyed. The few pocket beaches remaining will soon be gone as well. When will people stand up and say NO MORE?